M ore than 2,700 schools in the north-west of England faced disruption yesterday [27 June] as staff took part in a one-day strike over pay and pensions, unions say. The National Union of Teachers and the NASUWT said 2,765 schools were affected in 22 local authorities. The action was in protest at the introduction of more performance-related pay, changes to teachers' pensions with higher contributions, and later retirement and increased workload. Education Secretary Michael Gove wrote to both unions in March to say he was willing to meet them to discuss their dispute, but also insisting that the "direction of travel" on both their key issues was "fixed". A Department for Education spokesperson yesterday [27 June] added: "Industrial action will disrupt pupils' education, hugely inconvenience parents and damage the profession's reputation in the eyes of the public at a time when our reforms are driving up standards across the country. "It is disappointing that the NUT and NASUWT are opposing measures to allow heads to pay good teachers more. We have met frequently with the NUT and NASUWT to discuss their concerns and will continue to do so." 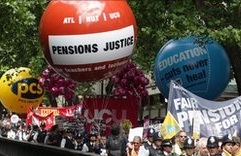 Unions warn of more regional strikes and a national one-day walkout across England and Wales in the autumn. Christine Blower, general secretary of the NUT, said: "We seriously regret the disruption strike action in the North West of England will cause parents and pupils, but with the profession now under serious attack from the government we have to take a stand to protect education and teachers. "The NUT and the NASUWT are asking the government to enter into genuine talks to resolve this dispute. The responsibility for today's action rests with the failure of the secretary of state to engage in meaningful negotiations." Strike action took place in Blackburn, Darwen, Blackpool, Bolton, Bury, Cheshire East, Cheshire West & Chester, Halton, Knowsley, Lancashire, Liverpool, Manchester, Oldham, Rochdale, Salford, Sefton, St Helens, Stockport, Tameside, Trafford, Warrington & District, Wigan and Wirral.